The youngest and the oldest members of your family all need high-quality dental care. When you need a children’s dentist to serve the oral health needs of your little ones, look to our local dental practice! It is suggested that children should make their first visit to the dentist at least six months after the eruption of their first tooth. 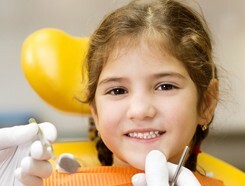 Our dentist is able to work with children from younger than the age of 1 to adolescence and beyond. We offer personalized dental services, solutions, and procedures in order to ensure the health and beauty of a child’s teeth for years to come. You can depend on us to utilize the latest technologies and techniques during all dental work, including routine cleanings and pre-scheduled procedures. Just as a pediatrician specializes in caring for the ever-changing needs of a growing body, so a children’s dentist specializes in the care of young and growing teeth. This means that the dentists from our office have undergone extra training and education in order to provide truly effective children’s dentistry! We have solid relationships with local residents who started bringing their children to us for their first trip to the dentist many years ago. They and their growing children depend on us to provide professional guidance and dental care year after year. Maintaining good oral cleaning habits is essential to the quality of your child’s dental health! As a part of your child’s dental regime, our recommended schedule for tooth cleaning for children is every 6 months. During your child’s tooth cleaning, our dentist will determine if there are any existing dental problems, as well as create a plan to prevent any future issues. Every biannual visit is performed quickly and expertly. Our goal is to help ensure your child’s interest in maintaining his or her oral health from childhood, to adolescence, and for the rest of their lives. 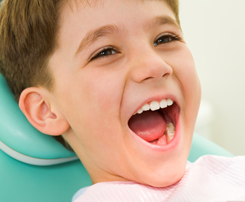 Are you interested in making an appointment with a children’s dentist from our local practice? Contact Morse Family Dentistry today and learn more about our special children’s dentistry services! Our practice serves the needs of St. Augustine, St. Augustine Beach, Vilano Beach, Palm Coast, Hastings and the World Gold Village, Florida.